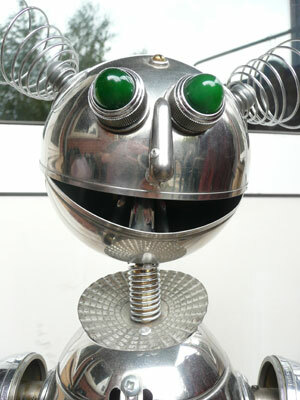 Serge Jupin, a London based artist who creates kinetic sculptures and animatronics from recycled domestic objects which he describes as ‘retro-futuristic in design’. Serge is as innovative with his use of power as he is with his choice of materials and powers his machines through a mixture of solar, electricity and wind up devices. Through her blending of personal and scientific narratives, artist Susan Aldworth aims to challenge conventional definitions of identity and portraiture through an examination of the internal structure of our brains, from the intricate details of the micro-circuits formed by billions of brain cells, to the output signals that the brain generates that are recorded through the scanning process and reflect our conscious experience. GV Art's permanent space on Chiltern Street is a five minute walk from Ambika P3 which hosts Kinetica Art Fair. During the week of Kinetica Fair the gallery will also be showing work by Andrew Carnie, Annie Cattrell, Katharine Dowson and other gallery artists. Dates and opening times will be the same as for Kinetica Art Fair 2011. Admission is free to the gallery.